Except every ball you roll must bank against a rail first! 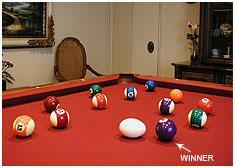 "Bobble Ball," the egg shaped billiard ball. However, players must use an angle to get there. is closest to Bobble Ball after all balls are rolled. By hand, players alternate rolling six team balls toward Bobble Ball, but they have to use an angle to get there...they have to hit a rail first! 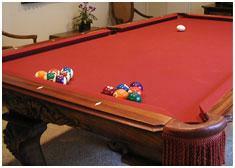 Once a rail is hit, the rolled billiard ball can hit any ball on the table. Players may knock their opponent out of the way, push their own billiard team ball closer, or not hit any other ball and just snuggle their rolled ball up next to Bobble Ball. Bobble Ball has been a competitive event in three Senior Olympics. Enjoy watching some our competive players striving for "The Gold." Upcoming Video Update: A few scenes in the video show players rolling billiard balls directly at Bobble Ball. 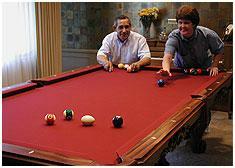 In a real game, billiard balls must hit a rail first before contacting any other ball on the table. Note: This is the same video as on the Home Page. have fun competing in a Bobble Ball tournament. Rule Change: The video states that a player must not step around the side of the pool table to roll. This rule has been eliminated. Players may stand any place along the side of the pool table, but still must release the ball before the head string. 1. A legal roll is defined as a player standing or sitting behind the foot string and rolling a team billiard ball by hand so that the ball contacts a minimum of ANY one rail (cushion). 2. A player must release his hand from the billiard ball by the time the ball reaches the foot string. 3. A player may not touch the billiard ball again once he has released the ball into a rolling motion. 4. A player must stand or sit to the left or the right of the center string depending on which quadrant of the table his team is currently positioned. 5. A player must roll the billiard ball in a manner so that the ball remains in contact with the table surface at all times. No player may toss, throw, or bounce any billiard ball at any time during the game. 6. A player must wait for the motion of all billiard balls on the table to stop before rolling another billiard ball into play or removing a billiard ball from play. A billiard ball stopping between the foot rail and the foot string is considered dead and is removed from play. If any part of the billiard ball is touching, intersecting, or dissecting the foot string line, the billiard ball is considered dead and is removed from play. A team billiard ball that is pocketed is considered dead. 7. A player must roll his billiard ball so that it contacts a minimum of one rail before stopping or contacting any other billiard ball or Bobble Ball on the table. When a rail is not contacted at all or not contacted before hitting another ball on the table, a foul of "minus 1" (-1) is recorded if the "win" method of keeping score is being used or "minus 2" (-2) is recorded if the "points" method of keeping score is being used. (Refer to Step 5 of the diagram above for an explanation of the two scoring methods). After a foul has been committed, the opponent may decide whether to keep the balls in their existing location or replay the frame. Note: A billiard ball that rolls directly into a pocket without touching a rail is dead and no foul has been committed. 8. Bobble Ball must remain on the game playing surface. If Bobble Ball is hit into a pocket, is hit so that it stops on the table surface between the foot rail and the foot string, or is hit off of the table, the frame is void and must be replayed. 9. A player is allowed to bank his billiard ball against any rail during his turn. However, if he chooses to use any rail between the foot rail and the foot string, he may not hit any of the resting billiard balls set up and waiting to play in that area. A player may request his opponent to move his billiard balls away from a rail if they are in the way of an intended shot. 10. A player is allowed to roll his billiard ball against any other billiard ball in play on the game table surface whether it be Bobble Ball, the opposing team's billiard balls, or his own team's billiard balls. (This assumes that the player has banked his billiard ball against a rail first prior to contacting any other ball on the table surface). 11. A player may bank a billiard ball against the rail on the opposing team's side of the table, but only from a position from his own team's side of the table. A player may extend his arm or hand, but not his body, across the center string into the opposing team's side when rolling his billiard ball onto the game playing surface. A player's body should not encroach onto his opponent's side of the table. 12. A player's roll is not required to pass the foot string in order to be considered a legal roll. If the team billiard ball rolled does not pass the foot string, the roll is valid (as long as a cushion was contacted). However, the team billiard ball rolled is considered "dead" and removed from the table surface. 13. 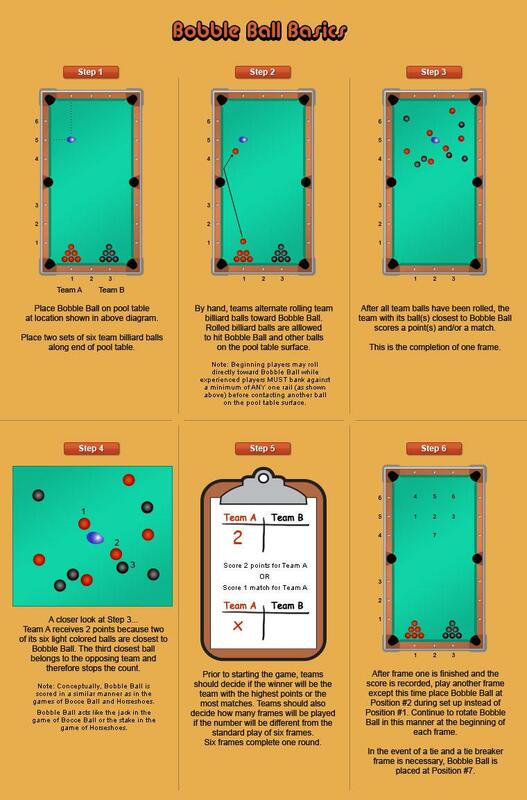 A player may not touch or move any team billiard ball or Bobble Ball which is on the game playing surface during the course of a frame or until the frame score has been agreed upon by both teams. In the case of a tie, both teams receive a half win/point. 14. Players/teams alternate rolling first from frame to frame. Team A rolls first when Bobble Ball is in Position 1, 3, and 5 while Team B rolls first when bobble Ball is in Positin 2, 4, and 6. 15. Observers may sit or stand around the perimeter of the table, but should be instructed to keep their hands and fingers out of the game playing surface area of the table. 16. A player is not required to call out his play or strategy in advance of rolling his team billiard ball. However, strategic discussions between all players serve to provide the game with fun, controversy, competitiveness, and improved skills. Assistance may be requested or offered without solicitation by players within reason and in a manner that does not disrupt the flow or atmosphere of the game. 17. All players should conduct themselves with manners appropriate to the game. Socializing and strategic interaction is encouraged. However, actions which are intended to distract another player or cause another player to perform under his capabilities exhibit poor sportsmanship and should be avoided by all participants and spectators. Appropriate language is also encouraged so as not to offend surrounding players. We will help you organize your first tournament! www.GUET.me - Inspirational website. GUET.me Stands for "God Uses Everyday Things ... Even Me"